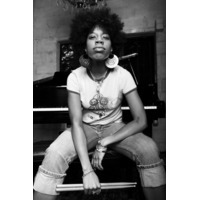 Georgia Anne Muldrow is an American singer and musician signed to Stones Throw Records. She is the first female artist signed to the label and seems to be a close friend of fellow label artist Dudley Perkins. Her father is the late jazz guitarist Ronald Muldrow and her mother is Rickie Byars-Beckwith (www.rickiebyars.com/bio.html) Musical director of Agape Spiritual Center in Culver City, CA and Stepfather is Rev. Michael Beckwith who is best known for being a teacher in the Movie and book "The Secret" . Her early work involved collaborations with the Platinum Pied Pipers, Sa-Ra, and J*DaVeY. She is known for playing the majority of instruments featured on her recordings. Her vocal style and musical accompaniment often are free-form in nature. Most recently she produced and is featured with Dudley Perkins on an album for Mello Music Group titled SomeOthaShip: Connect Game due out in early 2008.